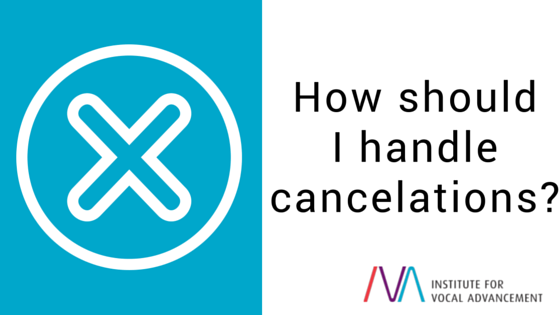 You are here:Home Hints and Tips How should I handle cancelations? How should I handle cancelations? Have you ever felt frustrated because one of your students did not show up for a lesson or canceled on short notice? Are you tired of losing income and having holes in your schedule? If this happens more than a few times a month, it’s time to set up a process on how to handle cancelations and no-shows to make your life as a teacher easier. Most teachers have a 24- or 48-hour cancelation policy. This means that if a student cancels closer to the scheduled lesson than the policy states or does not show up to the lesson, he or she will be charged the full lesson fee. The policy should also state how you would like students to communicate a cancelation so it reaches you as early as possible. This way you can possibly fill the lesson slot with a different student. Communication options may include a phone call, text message, or e-mail. Inform your students about your cancelation policy in their first lesson (or even in their initial inquiry). Some teachers even give their students a printout of this policy and have them sign it. If possible, have your students pay for the lesson ahead of time at the time of booking either via credit card, PayPal, or money transfer. Then you don’t have to chase the payment in case of a short-notice cancelation. You definitely want to be strict about the reinforcement of your cancelation policy so your students handle their bookings with you responsibly and don’t get flakey. As in any business, people will take advantage of your kindness if you do not follow through with your policies, and you can lose a lot of money and ruin relationships as a result. However, as always, there should be exceptions to the rule. You might want to be flexible with rare occasions for your students who are very regular and reliable. On a case-by-case basis, you might decide to not reinforce your policy and allow your student to reschedule the lesson, depending on your own impression of the situation. In case you as a teacher need to cancel a lesson yourself, be fair. Try to give students at least as much notice as you require of them in your policy. If you have to cancel on short notice, you might want to give them half of their next lesson for free or any other value to compensate for their inconvenience. If you haven’t done so already, take the time to create a studio cancelation policy and enforce it! Students need to understand that they are not only paying for all the experience and knowledge you have to pass on to them but also for your time. You have set aside a specific lesson time just for them, and they need to pay for it whether they show up or not. You will find that having a cancelation policy will make the business end of your teaching job easier, and it will also protect the good relationships you have with your students.